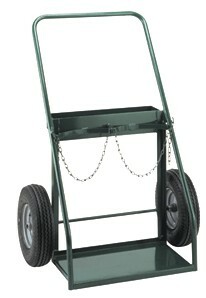 Popular double cylinder truck features a 14"x 24" base plate braced underneath with angle iron. Lip on back assists prevention of cylinder movement. Continuous handle is strong and safe. Furnished with large tool tray.